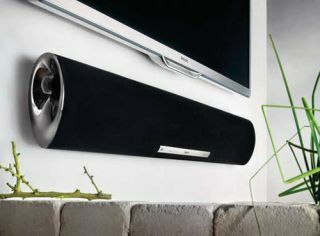 Philips joins the soundbar market with its £250 HTL5120 | What Hi-Fi? Soundbars are selling like hot cakes at the moment, and the latest to join the fray is Philips with the £250 HTL5120, available from May through John Lewis stores. It has built-in Bluetooth for streaming music from any connected mobile device, an integrated active subwoofer and Philips Double Bass and Virtual Surround technologies. Designed for wall or table-top placement, an integrated 'orientation sensor' optimises the sound depending on the unit's position. Power delivery is a claimed 2 x 60W, and Dolby Digital 5.1 and DTS 2.0 decoding are included as standard. The Philips HTL5120 soundbar also comes fitted with two HDMI inputs for connecting a TV, Blu-ray player, set-top box or games console. Additional connectivity comprises a 3.5mm input on the side, plus one HDMI out, a coaxial digital input and optical digital input as well as an analogue aux input.